Congrats! You're now a college freshman but good luck because you sacrificed your passion and yes my dear, up until now you're still not yet back in ballet. I'm not frightening you or whatsoever but allow me first to tell you this. 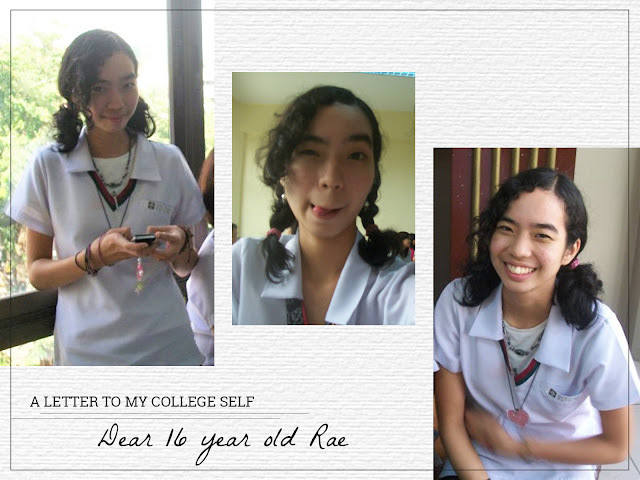 Rae, you should know that your ambitious plans will not all going to happen immediately right after college. No matter how hard you try because so much better things are in store for you. But I'm sure you'll not listen to me right now as you are very young and very ambitious. And that's okay because if you're not, you'll not be where you are right now. Also, don't worry because you're not going into any relationships yet, you're not going to meet any guy yet that will destruct you from achieving your dreams! I know, that's your fear up until now. But really, your life after college is going to be one heck of a ride! Believe me. At 16, you're very excited about the thought of everything because even though you sacrificed your real passion, interior design is 2nd in the list and you're so excited about fulfilling it. It seems like being an interior designer is just a step closer but honey, you're dead wrong! What you're experiencing is just the start of everything. Being a freshman, you'll learn the basics of the profession and you'll realize that house makeover shows are very fake and they gave a misconception of how fun and artsy and arte the profession is but in reality, it is very technical, serious, and difficult. The word "plate" will no longer be just a kitchenware to you because it will be your life for the next five years. You're going to wish that you've slept all throughout summer because apparently, you're not gonna get any sleep at all throughout your college life. In the first night that you'll literally not get any because the perfectionist you keeps on smudging ink in your graphics plate, you're going to cry because (1) you're gonna be up all night and (2) you're gonna waste so many buff paper and you're going to restart your plate at least 7-8 times before getting that "perfect" one. But you'll learn and you'll realize how expensive the materials are that you're gonna be careful from then onward. Freshman year is filled with fakeness and plastics but I guess you should be grateful as you'll learn in the later years that you should be friendly to everybody but you should only trust the few. Actually, you're going to have a huge group of friends (barkada) in the first few months of your freshman year and you'll be happy with them as you go to one's house during vacants but eventually, everybody will go and have their separate groups. You'll have yours too but sometimes, ambitions kill friendships and your circle of friends will not be as strong as it used to be by junior year. You'll have a best friend though who'll be with you no matter what. Sophomore year is going to be so tough. You'll be bullied emotionally by your blockmates and you'll shed tears because you'll feel as if you're alone and no one wants to be your friend. But then you'll meet your YFC Family and they'll accept you for who you are and that you don't have to change yourself because they'll love you for being you and they'll help you grow while making your faith and love for God stronger. Junior year is going to be complicated. You'll stop studying for a year because of financial problems. Again, you'll cry because you already sacrificed ballet and now, you're going to sacrifice your studies. But guess what? Even though it hurts a lot you'll realize that this is God's way of telling you "Relax. I got this. Trust me". Because in this year, so many great things would happen. 2012 would actually be a good year for you. You'll model a few times (ramp and photoshoot), you'll dance in front of David Archuleta, you'll join a dance sport competition for the first time and you and your partner will be the 5th runner up, you'll open the Trishie Couture Grand Launching, and you'll finally, finally be an 'official' YFC member. Those were just the highlights but it really was a good year for you and by the time you get back to school, you'll realize how much of a good plan God has for you. Junior year now is a little bit like freshman year again, with all the adjustments and all. But this time, you're much stronger and so much determined in reaching your dreams! As you can see, since you stopped for a year, you'll have new blockmates and they'll be so much nicer! And then, you'll have more friends and you'll meet so many great people! Also, you'll realize that you are loved and appreciated as so many people missed you and are glad that you're back. And of course, with your love for dance, you'll join Ola Bayle again and this time, you and your partner will win 1st Runner Up! Also, you'll dance in front of the 1st Filipino Figure Skater, Winter Olympian, Michael Christian Martinez! Senior Year is going to be, let's just say, bittersweet for you! Aah, your last year in UST. How time flies, eh? You are called by God. You are tapped to be YFC-UST CFAD’s (now Beato <fine arts + architecture>) Senior Sister. It's a big responsibility but you'll be able to create a strong bond within your Beato family and being a Senior Sister, it would affect your life in a positive way as you'll also grow along the way. But then, by the end of 2014, you'll have a very difficult time as you'll lose your beloved cousin in the middle of thesis, you'll feel unworthy of being called to be YFC-Beato's Senior Sister, you'll feel pressured, and you'll be financially broke because of thesis. But you'll survive everything and you'll learn to continue living despite the pain. You'll graduate and all you can think of is pursuing your first dream. For 5 years you patiently waited but I'm so sorry to tell you that 7 years passed by and you'll still not be able to go back to ballet. But don't worry young self, I'm doing the best I can to get back to formal training. I just have to save up and work on my busy schedule. We can do this! Actually self, because you wanted to go back to ballet so bad, you'll be so effin' lost and you'll keep questioning yourself on what you are doing with your life. You'll shed lots of tears. Lots, and lots, and lots of tears. You'll go through a quarter life crisis but after that downfall, you'll be able to pick yourself up and you'll be able to regain yourself as you work hard for your company. You'll meet lots of people along the way and you'll end up being friends with people through the most unlikely circumstances. It'll teach you that those people who've been with you through your toughest times are the ones worth keeping. So treasure them like how you treasure your family. Your life is nothing to what you have ever imagined and planned because it is A MILLION TIMES BETTER. You went through challenges and difficulties and I'm sure you'll still go through them sooner or later but God's plans is way better than yours. So you just have to trust in Him. He has his ways and though there will be times that you can't understand why it's happening to you, you'll eventually realize why everything has happened to you. You'll realize this once everything is falling into place. At 23, you are very mature with how you handle your life. You are very strong but all I 'wish' is for you to stop wishing and start living in the moments of pain and happiness because life is beautiful that way. Please don't give yourself a timeline because you'll reach your dreams. You'll get there so don't pressure yourself. Whatever it is that you're doing, is already enough. Just keep on doing what you're doing and live in the moment! Just make sure that what you're doing right now, your future self will thank you for it. You are a work in progress so you have to love your life as it is. I love you and I just hoped that you were able to see how wonderful and beautiful your life is at an earlier stage than I did. But I am so proud of you. I am so proud of how you live up with your decisions and I am so proud of how you cried your heart out in front of your parents and told them what you feel and what you really wanted to do with your life. I am so proud of you, Rae, and I am beyond grateful with how you handled your life. Now go live your life, inspire the world, and chase your dreams! There's still so much ahead of you. You have certainly worked hard and accomplished much - it's nice that you have the accomplishments to look back on, and so much knowledge to draw on. Your artistic talents and accomplishments are very impressive - an enhanced 'ballerina on fire' - kudos.